Hacksaw Ridge co-producer Steve Longi is publishing a book that tells the story of what happened to Desmond Doss before he got to that ridge. From history buffs who want to dig deeper to young people who might not have been able to watch an R-rated movie, this short book offers Doss's story to an even wider audience. Question: You have recently been involved in getting a book published. 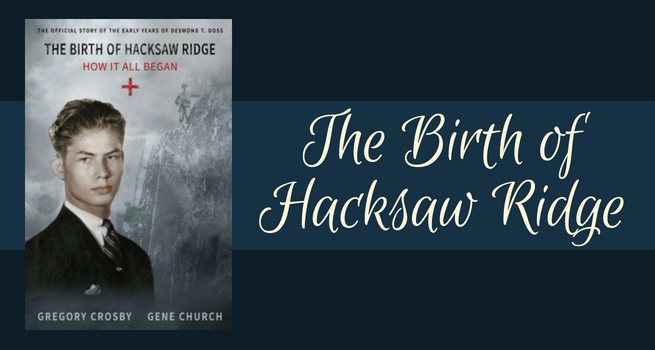 The Birth of Hacksaw Ridge: How It All Began is the story of the early life of conscientious objector Desmond T. Doss, a Seventh-day Adventist World War II hero and Medal of Honor recipient who was the subject of the 2016 film Hacksaw Ridge, which you produced. How does this book add to what we know about Desmond Doss? Aren't there several books about him already? Answer: This is the only book specifically focused on Desmond’s early years growing up in Lynchburg, Virginia. Most of what is contained in the book has never been told before. This book is also being published with the permission of The Desmond Doss Council, and it receives a portion of the proceeds. It is a great organization dedicated to overseeing and protecting the legacy of Desmond Doss and committed to sharing the “Live like Doss” message around the world. The book is for younger people and families. It’s for the audience that maybe didn’t get to see the film, since it was rated R, and fpr people who like true stories about World War II heroes. Adventists and all people of faith will certainly appreciate it as will anyone who is looking to be inspired and uplifted. Who wrote it, and who is publishing it? Gregory Crosby (grandson of Bing Crosby) and Gene Church wrote the book, and my publishing company, Longitude Entertainment Publications is publishing it along with Pacific Press editors with whom we just recently started working. Why should people read The Birth of Hacksaw Ridge? To learn about and fully understand who Desmond Doss was: where he came from, how he found his faith, and the events that shaped his early life that made him into the man he had to become, in order to do what he did on that ridge. How have you been involved with getting this book published? What is your role? I conceived of the idea, and as publisher, oversee the day-to-day business of marketing and distribution of the book. You have been a film producer for a long time, right? And you have been involved in some high-profile films with well-known actors. How is Hacksaw Ridge different than other films you have worked on? My first film was Double Take for Disney back in 2001. Hacksaw Ridge was a long development process. We took great pains to make sure we were doing it right: best talent, best script, the best all around. We had a responsibility to Desmond and many others. We became close to directors and even actors throughout the years. I think we were totally blessed with Andrew Garfield, and of course, he was nominated for an Academy Award, so I don’t think it gets better than that. This film also had a much higher budget than my other films (around $45-50 million). How did you first come to hear about the story of Desmond Doss? I first heard about the project on the set of my first film. I met Gregory Crosby, and he gave me a treatment he had written about the story. I was blown away and knew I had to do everything I could to get it made into a film. What was your role as co-producer of Hacksaw Ridge? You said it took a long time to get the film made. Can you tell us about that? It was in development for around 16 years. The project started at Walden Media. It had produced The Chronicles of Narnia. Ultimately, Lionsgate picked it up. How did you feel about the final finished Hacksaw Ridge that film audiences saw? Was it as good as it could be? I am enormously proud to have been a part of this film. It was a collaborative effort, and the people who worked on this film are all at the top of their craft. It was an amazing experience for me, and to be nominated for Academy Awards is practically every dream I’ve ever had, come true. What was it like to work with Mel Gibson? Mr. Gibson is an accomplished filmmaker and storyteller and worked hard to make sure the film was truthful to the actual events. Of course, there is some license that has to be taken with certain details, and we actually couldn’t tell some of the things that happened because it was just so incredible that we thought people might not believe it. Did you feel that the requirements laid down by the Desmond Doss Council about sticking to the facts were difficult to meet? Actually, there weren’t many requirements by the council, but it was very important that Desmond not be seen touching a gun or using foul language. I hear you are making another movie about Desmond Doss called C.O.? Can you tell us about that? I can’t talk too much about that right now, but there is an idea for this book to be the basis for a prequel, of sorts, to the movie, perhaps as a limited mini-series or movie. We are in talks now and will be announcing something soon. Do you have a connection to Seventh-day Adventists? Are you an Adventist yourself? I was raised as a Roman Catholic, so that’s my closest connection along with the movie now. What do you like about the movie business? I often say that I have the best job in the world. I’ve wanted to work in the film business since I was 11 years old. I had a subscription to the industry trade paper Variety delivered weekly to my house in New Jersey. This was all I thought about. I knew that movies were powerful and had the power to uplift and inspire people. I like true stories as well as comedy. My goal is to do my part in making the world a better place. That’s why I’m excited about this book. It’s a great introduction to Desmond, and young kids and families can embrace it even before they see the movie. I hope it helps make a difference in all of their lives, and that’s what I love about the film business. I always have a number of projects in various stages of development. I’m working on a really fun project called Zombie Prom which is based on an off-Broadway musical and a favorite at high schools. I’ve also just optioned the rights to a true story about a civil rights activist in the early 1970s. You can buy The Birth of Hacksaw Ridge in paperback or as an ebook. Image courtesy of Longitude Entertainment Publications.